One of the nicest aspects of getting a book published is the chance to meet new people. The talented Richard Dansky is the author of Firefly Rain, the first book to be released as part of the Wizards Discoveries imprint. Richard's web site describes him as a "horror writer, game designer, and general cad." 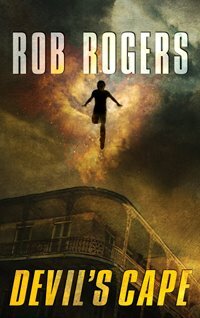 Richard has several other books to his credit, but Firefly Rain is his first original novel (the others have been in shared universes or with existing properties). Richard is a game design manager for Red Storm Entertainment where, I was delighted to find out, he has played softball with my cousin-in-law. Small world. At any rate, Richard agreed to an interview on this blog. So here goes. Read this and then go pick up Firefly Rain. It's a good read. Richard, I just finished reading Firefly Rain, which I enjoyed a good deal. Can you tell me what sparked the idea for the book? Was there a particular concept or image or thought or incident that led to this story? The image that really sparked the book came from visiting my wife's family farm for the first time. It's out in the middle of nowhere in Missouri, and the closest I'd seen to something like that growing up was the golf course across the street from my parents' house. So that first night out there, when we went for a walk, there was a full moon and the light in the fields was so bright you could read by it. Off in the distance, you could see the treeline, and that was absolutely pitch black. And it was that image, that stark juxtaposition of light and dark, that turned into the core image at the heart of the book. I ended up reversing it – in the novel, it's Jacob Logan's land that's dark, and everything around him is lit up – but the sense of that clean cutoff is still there. In the acknowledgments for Firefly Rain, you mention one person "for much-appreciated assistance with shotguns." I ended up getting assistance from a friend for a scene in Devil's Cape involving a shotgun, so this one caught my curiosity. What kind of shotgun wisdom did you receive? The shotgun in Firefly Rain (not to give away a plot point or anything) is a far cry from the sorts of guns I usually end up referencing in the Tom Clancy video games I worked on. Those guns, I can write about with a fair degree of confidence, but the sort of shotgun you'd find out on a farm, well, not so much. The gun in the book is actually based on a shotgun that my father-in-law had owned, and Geoff Grabowski was kind enough to double-check what I'd written about it to make sure that it actually behaved and was built the way I thought it was. What's your favorite moment from a video game? This can be either a favorite moment from a game you played or a game you worked on. I think the video game moment that resonated most with me actually came during the development process for Ghost Recon: Desert Siege. I was playing the Ghost Town map, which had a deserted shantytown of corrugated tin and whatnot in it, and we'd just put the full sound treatment in the level. So there I was, creeping through the abandoned shacks, pretty sure that I'd cleared the area out, when suddenly a sniper took a shot at me. The shot missed and hit the sheet of tin next to my guy, and it made this tremendous, shocking SPANGGGG sound that spooked the hell out of me. I think I went about a foot straight up in the air. Mind you, I kept my hands on the keyboard & mouse and managed to take out the sniper, but even so, that was just an amazing moment, one that really brought home how immersive video games can be. With a background that touches on role-playing games, computer games, book publishing, horror, and beyond, you must end up at a variety of conventions. What's your favorite convention story? The best thing that ever happened to me at a convention is that I met my wife at one. If the folks who organized Gateway, in St. Louis, back in 1999 are reading this, thank you. I owe you one. On a lighter note, I have a ton of great memories (and wacky hijinks) from various conventions and conferences over the years, some of which are barely printable, illegal in fourteen states, or the sort of thing that involves jumping naked into a large body of water in Scandinavia. If I had to pick just one, it would probably be driving Gahan Wilson to a miniature golf course at NECON a few years back, and then playing 18 tiny, astro-turfed holes with him. We had a wonderful conversation about synagogue architecture and how the air conditioner may be responsible for the decline of the American neighborhood, and all the while a little piece of my brain was screaming "Oh my God! I'm talking to Gahan Wilson!" And for what it's worth, he's not half-bad on the putting green, either. Just that I'm very much looking forward to reading Devil's Cape - it looks fantastic. Rob Rogers lives in Texas. The author of Devil's Cape, he is a writer, editor, and communications project manager by trade. What Veronica Mars character are you? Teen Titans Year One: Haven't I seen this before? All original content is copyright Rob Rogers, 2005, 2006, 2007.